Subaru will score big with families on Super Bowl Sunday. The Barkley dog family is back this time with the all-new 2019 Subaru Ascent. Subaru won’t be advertising the new 2019 Ascent 3-Row vehicle on any Super Bowl spots, but they will still score big with families on Super Bowl Sunday. Subaru, a sponsor of the Screen Actors Guild Awards, announced Sunday night they will feature four new TV ads on Super Bowl Sunday on Animal Planet's Puppy Bowl again, and the Cherry Hill, N.J automaker will feature the all-new 2019 Ascent Family hauler. Subaru will get help from the Barkley dog family riding in the new Ascent 3-Row vehicle as they launch the Super Bowl Sunday ads. Brian Cavalucci, national advertising manager for Subaru of America, says this is the eighth consecutive year for the automaker being featured at the Puppy Bowl on Animal Planet. A 30 second Super Bowl ad will cost more than $5 million this year according to Sports Illustrated, so it’s understandable why Subaru would choose another channel to advertise the new Ascent family vehicle. Subaru knows many of their customers love dogs and they are capitalizing on this again in 2018. Subaru says, eight out of 10 Subaru owners are pet owners. Even if you don’t own a Subaru, the commercials are good. The national television spots are created by ad agency Carmichael Lynch on behalf of Subaru of America. They created the “Dog Tested. Dog Approved” campaign that has been a huge success for the brand. The ads should score big with families in two ways, as they pay tribute to the scenarios Subaru drivers find themselves in with their own families, while also showcasing the brand’s longstanding love of pets. 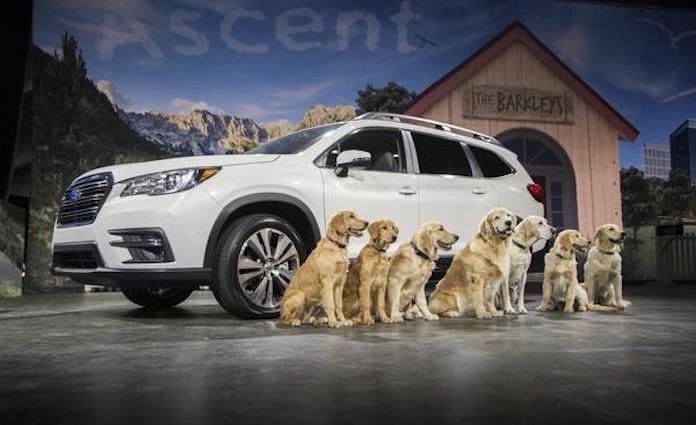 Subaru even used the Barkley dog family at the launch of the all-new Subaru Ascent family vehicle when it was unveiled at the LA Auto Show. Tom Doll, COO of Subaru of America announced the new 3-Row family hauler as the Barkley family drove in the car onto the stage and then piled out to pose for the media. With so many dog lovers in America, Subaru is capitalizing on it. The newest Barkley family dog ads will focus on the all-new 2019 Subaru Ascent that will surely be a big family and dog-pleaser. The all-new 2019 Subaru Ascent will be on sale in early summer 2018.